A pet can be a great comfort in times of stress, and stress was exactly what Lillian Milstead had been going through as she endured multiple brain operations to release pressure on her brain to preserve her eyesight. “I found myself in chronic pain and felt that if I had a small dog to pet and love, it would help my anxiety and keep me moving,” she says. The Slidell, LA, woman wanted a Yorkshire Terrier and found one listed by St. Tammany Parish Department of Animal Services, Lacombe, LA, on Petfinder. The dog had come to the shelter in deplorable, dirty condition with long matted hair. Chere offers joy and comfort to her pet parent, as well as some laughs. Lillian arranged to meet her, and though the dog was timid, she was also loving. “I have a house cat, so I asked them to put a cat in the room with us so I could see how she reacted.” The staff did so, and the Yorkie didn’t pay any attention to the feline distraction. That clinched it for Lillian, and she filled out the paperwork. The shelter, however, did its due diligence by doing a home visit, but all was okay. Soon Chere was ensconced “as boss of the house,” as Lillian puts it. Lillian still has health problems, but Chere has been a much-needed distraction. Lillian walks her several times a day, keeping them both active, and the little pooch’s funny quirks bring healing laughter into the house. “At 8 p.m. she stands in the bedroom door and barks at my husband and me, trying to make us come to bed,” Lillian say. “If she doesn’t get her way, she does this little snorting thing. It’s so funny.” Chere also barks at the cat to make him play, which results in a hilarious chase through the house before the dog and cat settle down for a nap together. 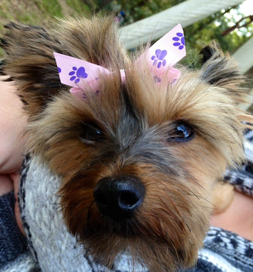 Chere is a joy for Lillian, and she feels lucky to have the Yorkie to help her through the tough times.